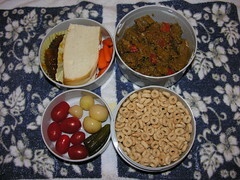 Our youngest son is still home from college and made some golden beef curry, so it's going in my Mr. Bento on Monday, August 26, 2007. The curry is over brown rice. Accompaniments are french bread, major grey's chutney, carrots, Vietnamese pickled eggplant, sweet pickles, and tomatoes. Cheerios for breakfast.